Help me Choose a New Spring Jacket! It’s the last day of winter, time to freshen things up. Salute the last of the snowdrops and lay down in that bed of daffodils! I’ve decided to give my novel a makeover for the new season. My agent had been asking for a while for new artwork for the cover but I have been holding onto the fuschia–such an uncommon color in today’s world, unique even, deserving of more prominence. The UK and the US can’t even agree on the spelling of it, that’s how unique it is. 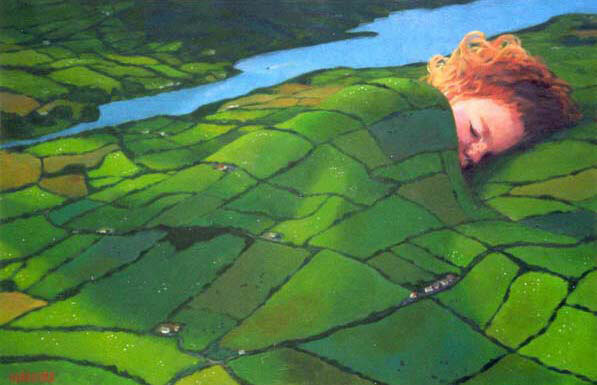 But then my lovely friend over at FashionAssist sent me the following painting by Barrie Maguire in honor of Saint Patrick’s Day but also because it reminded her of the young Kat in my novel Silk for the Feed Dogs and I suddenly saw things differently. Isn’t the painting lovely? It captures perfectly the idea of a country lass at home in her environment, content with her lot––or plot. Whether she’s from Tortilla Flat, the last surviving stagecoach stop on the Apache Trail with a population of 6, or the foothills of the Alps where cowmen stroll the single cobbled street in yellow breeches and scarlet waistcoats, pluck said bumpkin out of her natural habitat and drop her from a great height into the upper echelons of the international fashion industry and see what hilarity ensues. My novel cover should express the story of the novel as effectively as this painting. So, that’s where I need your help. From the selection of 4 below, tell me which artwork you prefer for the new cover: Even if you haven’t read it (yet?) give me your gut response. I’ve got an Excel sheet to record all votes. As you can see I’m not messing about. Until final vote tally, the last of the fuchsia is still available. Limited time only. Collectors Edition. You can buy Silk for the Feed Dogs here. Love them ALL but c’mon…you know Kat likes her drink, Jax! It’s #1, absolutely! !…OR, well, I really like #2 also (A girls’ gotta work! )….errrr, #3 is nice too, Edward does deserve a cover! But not the dogs…too scary, NO DOGS! How’s THAT for indecision?! Well you asked. Not the dogs, too in your face. Kat and Edward conveys more of a love story to anyone who hasn’t read it and that is not what your book is about. The first one is lovely but number 2 is your book: young girl starting out in the business, trying to make a career for herself, the world of fashion still looming large and a bit menacing. 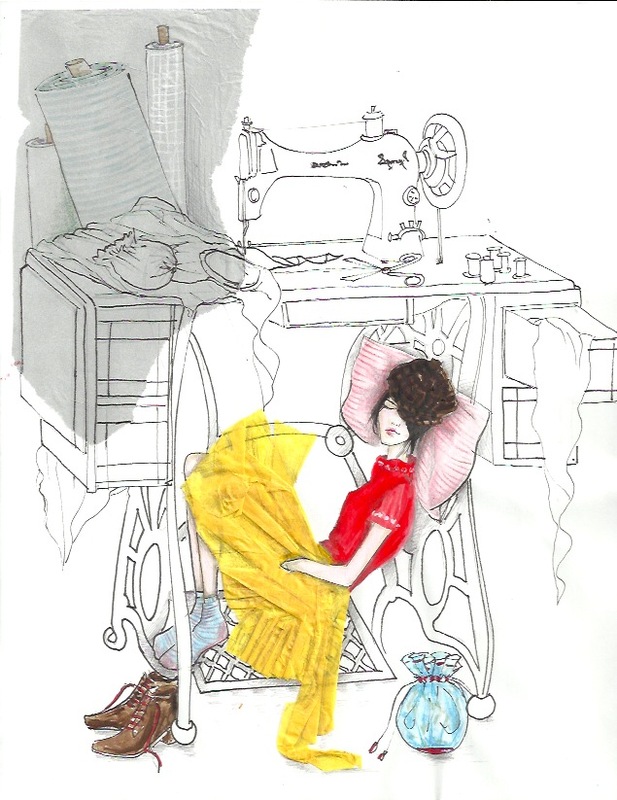 And the sewing machine fits in with both the title and the fashion industry at large. Did you draw them??? You probably don’t want to hear this, but I think you should keep the cover you’ve got. It has an enigmatic quality that pulls you in, but if you’re hell bent on change number 1 would get my vote. Number 1, first runner up – Number 3 wins, the mood is happy and I ride a blue scooter. 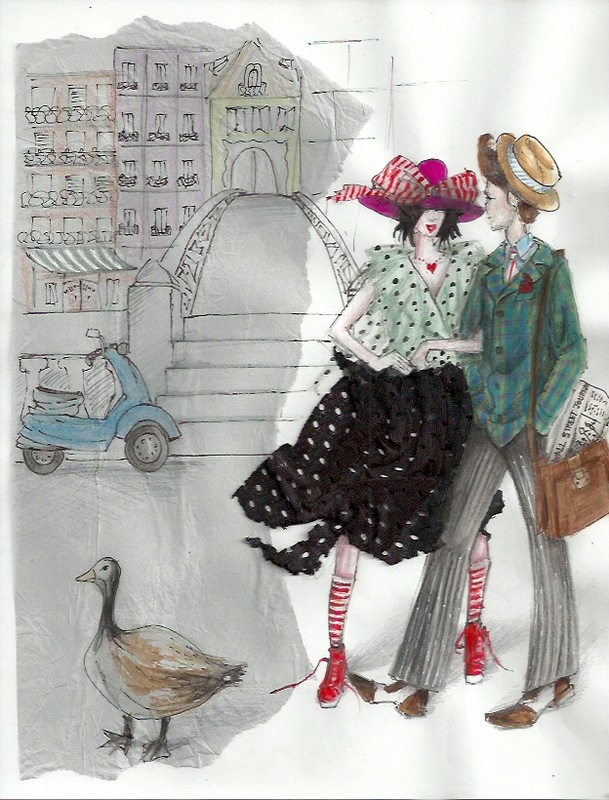 I love the mixed media drawings – all of them. I haven’t read it (yet) but if I have to chose I’ll say #2. Your new illustrations are all fabulous, but to be honest, I think your original cover is still best for what you want. The punch of colour communicates Kat’s nonconformist vibe, and graphically it works to make your book stand out even at the small image sizes on Amazon. I’d get rid of the hard-edged blocks of colour that contain your title and publisher – they overpower the fabulous freedom of the illustration behind them. Perhaps that was your intention – to show the conflict between Kat and the “establishment” – but someone who hasn’t read the cover copy doesn’t know about that yet, so it detracts from the strength of your image. Then I’d choose a “free-er” font instead of the cool, constrained one you currently have. Make the title bright (maybe the purple of the current title block) and large enough so that it reads in the small display size on Amazon. And make it ‘dance’ with your illustration. (Sorry, that sounds impossibly artsy-fartsy, but since you’re a designer I hope you know what I mean.) It shouldn’t be so ‘artistic’ that the title becomes unreadable, but let it play a little. One last detail – if you’re using a white background, create a black outline around the image that you use for your Amazon listing – it makes the book pop out of the background better. 4 is AMAZING. So fun. 2 for a book cover. I quite like the original as well. Although it strikes me as more of a cover for one of my fashion textbooks. Reminds me of my fashion illustration textbook. Maybe Silk for the Feed Dogs will be come required reading in fashion schools. 2 has a whimsical quality to it and makes one want to know more about the girl napping. What’s her story? Plus I love line drawings. I admire the skirt in 1. I keep staring at it to make sure its not actually moving. That’s a very astute comment, Corinne, about the illustration text book. Interesting…Required reading, I like your style! Stop staring! I love my original cover, but if I could chose a cover, I’d go for #2. I love them all. If I have to pick one or two, I’ll go for Dynamic Hats and Cocktails or At The Factory. 2 seems the most obvious peek at the story and it’s setting. It grabs you if you love clothes but don’t yet know what feed dogs are! 1 is just gorgeous, but the viewer starts weaving their own story about this girl and the veil puts her in the ’30s…. They are both much lighter in mood than the current cover. I love the fine details which invite me to inspect the book. I vote for #4. It’s wonderful! The whole book is about the fight for self expression, fairness, love, trust and fun fun fun…the dogs express that beautifully. I like the other artwork but it’s just too sweet. 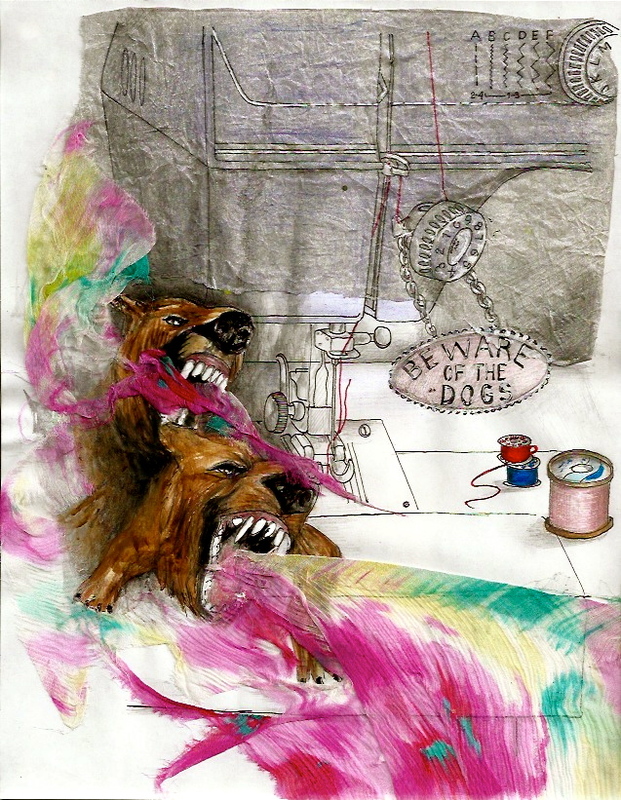 Although, since it looks like I’ll be outvoted on the silk dog cover, I’ll vote for #2. Is there some reason you can’t use the painting of the child in the fields? That’s really sparking me. How fun! I’m in the middle of “Silk for the Feed Dogs” (Why do I always want to call it Food for the Silk Dogs??) right now and loving it. Except for the cover. I don’t think it’s as visually appealing as your words, if that makes sense. The book is so so rich and well written that I’d like to see a cover such as No. 1, which is attractive yet it also tells a story. I believe that that’s intriguing to readers, to see a cover that holds a bit of a mystery. It makes them (almost forces them, actually), to peer inside). But of course that’s just my opinion and I see that many commenters actually prefer the current cover. So take my advice as a grain of salt, okay? Cheers and happy writing. I agree with DFM above to keep original, but if it has to change then #3 for me! 2 for me wins the jacket! # 1 !!! OMG, we all have different views, but my choice is simple : I love purple even more than fuchsia ! What is it with Irish women and wearing fuschia? My mother adored it too. There’s a reason it’s uncommon Jackie – my mother would have been 100 this year! And when, ever since that Webster upstart, have the UK and US agreed on spelling? Your copy-writer must do well out of you! I like #1 (specifically the hat in the mirror) but hold on, I’m not finished yet. I like #2 but the is unsynced scaling makes me think I’ve been drinking. Put #3 on the new cover please because it IS the book. Scrap #4 because dogs aren’t really dogs per your helpful explanation to male ignorami in the book. 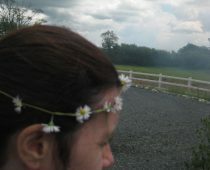 Away or that wi’ye, sure isn’t fuchsia a noble color and isn’t an Irish woman always right? Your mother’s fine taste was legendary. All the same, your insightful cogitations on this matter are greatly appreciated. I’m also with those who like the present cover. But if you do change, my vote goes to nbr.1. On the other hand, as a keen e-reader what I would like to see would be a collectors edition with your illustrations adorning the story. That would prompt me to buy the paper version. But I hope you don’t take this as yet another suggestion, merely a wish! Oh, if only! I would love such an opportunity. I share your wish, Lia! Although I think the more general reading public is not so patient for illustrated novels anymore–unless they become graphic novels which wouldn’t be my bag at all. and I adore every one of them!! 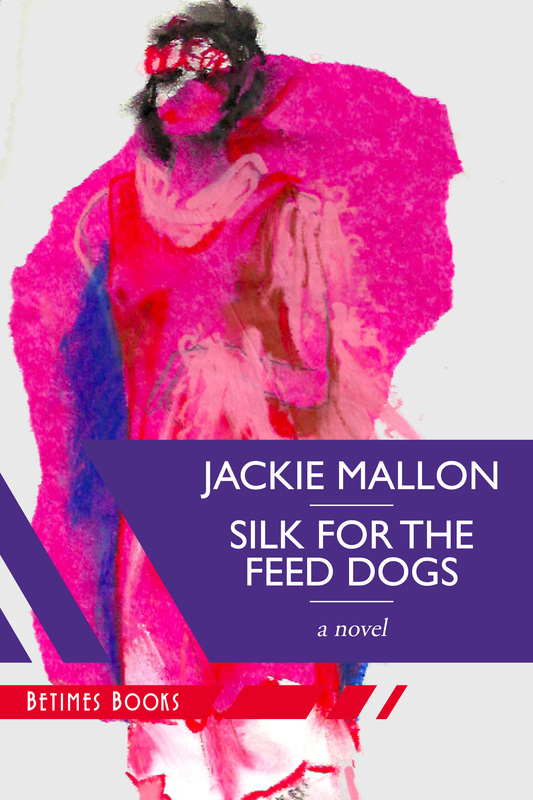 because as I continue my intriguing read of Silk for the Feed Dogs, I realize that this story is about Kat finding herself and coming to terms with the very creative Irish woman that she truly is (something each of us must do). to fully become the one-of-a-kind couture piece that she was designed to be. and I can’t wait to finish the read and celebrate with her!! 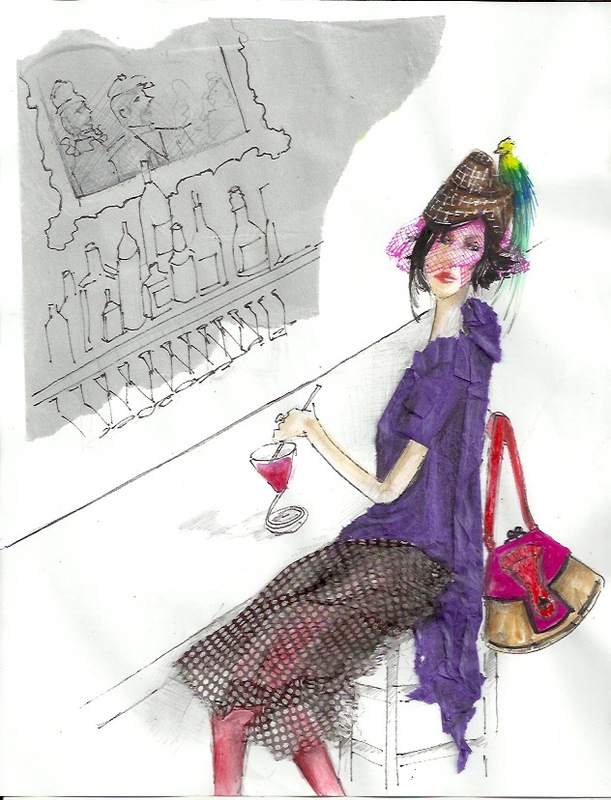 I love your expression “behind the veil of fuchsia silk” and the idea of Kat in a chrysalis. That’s so spot on! I really enjoy your take on things and so excited that you relate to our plucky heroine. If there is ever a possibility to create an illustrated novel, I’ll get right on it and dedicate it to you and Lia! May your continued reading be just as pleasurable.XO! I love this exchange of ideas. It has, I confess, motivated me to finally order a print copy. Can’t wait! (So isn’t that the question, what cover is going to make more readers open the book?) And yes, I want an illustrated edition, too! It is a great exchange, isn’t it? It’s a counsel of creative advisement, is what it is 🙂 My very own focus group. Glad you’re convinced to buy the flesh and blood copy. It’ll be a great companion on these spring nights. Hm. I was going to say #4 but it seems to be putting some people off. Number 1 was my other favourite.